Though I've played sports my entire life I've always struggled with weight. After high school I stopped playing organized sports and immediately started gaining weight. Over the course of 2 years I went from 210lbs to 260lbs!!!! At that point, I said "Oh man, NOT COOL... I gotta get more active". So I began exercising more, eating less... trying and trying to lose weight. I would slowly lose a little bit and then gain it back... slowly lose a little bit and gain it back. For over 4 years I've been doing this and I managed to drop down to 244lbs all the while exercising 6 time a week. Between hockey, football, basketball, and jogging a few miles in-between days I really thought I'd start shedding the weight. One Saturday playing football I tore ligaments on my ankle, so I was OUT. I thought - "There is NO WAY I'm going to sit around and get fat. I have to do something!" At that point, someone introduced me to the Fat Release System since it was a "No Exercise" diet. I was interested. I did the research; I really looked into this. I thought, "With my 'healthy' appetite and love for food, there is NO WAY I'll be able to finish this!" 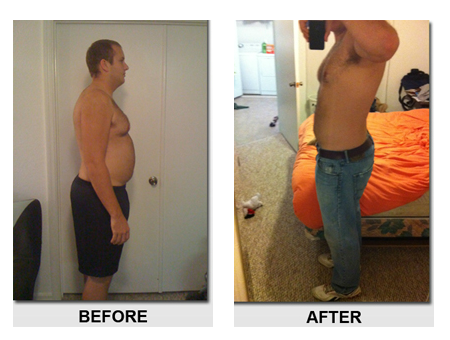 I started the 40 day protocol and have lost 27lbs in the first 24 days! I haven't felt hungry or tired. I've had plenty of energy and seeing the results makes it really easy to stay on course! I'm excited about finishing this diet, so all of you can see just how well this diet works. I'm confident that as someone who used to eat out all the time and eat a lot, ANYONE can do this diet. Just have to make the decision to start, follow it 100% and you WILL see results!